Is it just me or have the last few weeks seen a huge upsurge in people asking how they should design software , how they should code it, showing us their code and asking us to fix it? There also seem to be many more questions asking us how software works, how to fix software install problems, etc? 1) am I just imagining this, or are others seeing it too? TO me, it's not just a minor increase, but a huge surge. 2) if so, is there anything we can do about it? Sweet beans & collard greens!! I am absent for a few weeks, owing to a new contract, and .. I suggest expanding the list of sites in the Close Vote reason Belongs on another site. That will at least give the 'offenders' more information than Blatantly off-topic (which they would have to read the tour for to understand why - and we know how much people read). It would still require discipline from close-voters to distinguish questions that would be off-topic 'over there' as well (a bad question is a bad question). 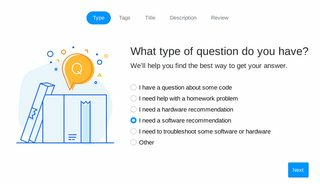 On 2018-12-19, the test of the Ask Question Wizard started at Stack Overflow. According to Nicolas Raoul’s answer, the traffic started to increase on 2018-12-20, so it seems very likely that the cause was this test. What has this done to the traffic on software/hardware rec. and SU? We'll see. It's one of the things we're monitoring over the next few weeks and in the long-term. ¹ I don’t know if the test version used the same wording, the linked Meta post didn’t document this. ² According to some comments on the linked Meta post, the wording might have been different at some point of the testing phase. Hi [lost soul], welcome to Software Recommendations! 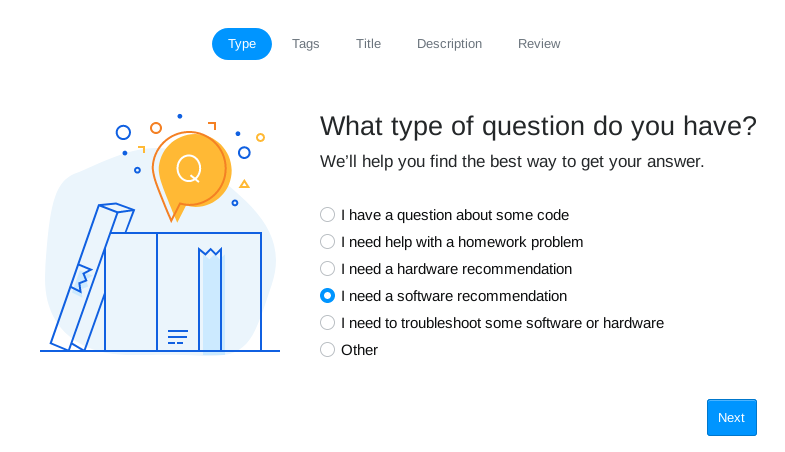 This question does not appear to be about software recommendations, within the scope defined on meta and in the help center. You can install the userscript with this direct link. From December 20 to January 19, the daily number of questions was 5 times more than usual. Now we are back to usual levels. 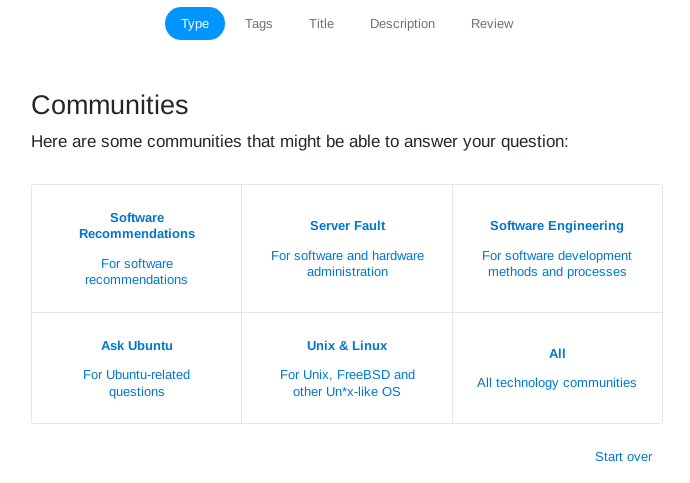 Maybe it was a one-month experiment by someone at StackExchange, maybe we got featured somewhere, maybe we will never know. Do I miss this popularity? A bit honestly, even though the moderation load was difficult to bear. What's up with all the low-quality questions in 2019? Can we get a close reason saying “Not enough information”? 90 days have past, how do our statistics look? Is asking for sample, illustrative code on-topic? Are “this is a bad idea” answers permitted? Is suggesting python libraries/solution a proper software recommendations? Resources for training about software? Asking question about upgrades and versions of software, would this be on topic here?